All natural homemade dressing produced by Pizza 4P's. It's a balsamic vinaigrette with a kick of mustard. It goes well with green salad and fresh cheeses like mozzarella and burrata. Not only making cheeses by themselves, but also they source vegetables directly from organic farms in Da Lat. And they are even building their own dairy farm in Da Lat. With its "Farm to Table" concept, they aim to connect local producers and the restaurant and offer fresh, safe, and natural food to the customers. 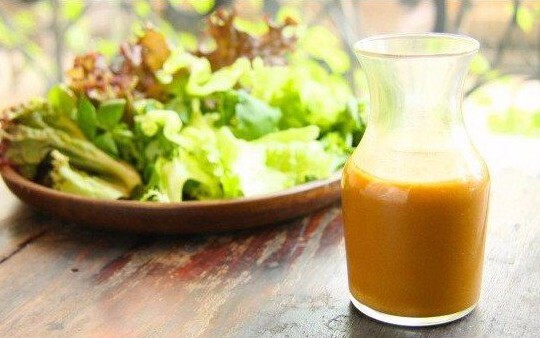 Simple but rich balsamic vinaigrette natural homemade dressing produced by Pizza 4P's. It's a balsamic vinaigrette with a kick of mustard. This simple but rich vinaigrette goes well with any salads, but it works especially well with Pizza 4P's Burrata Rocket Salad. The creaminess of burrata and sourness of balsamic vinegar create a great harmony of flavors. It's a great salad to impress your guests at the home party. Not only making cheeses by themselves, but also they source vegetables directly from organic farms in Da Lat. And they are even building their own dairy farm in Da Lat. With its \"Farm to Table\" concept, they aim to connect local producers and the restaurant and offer fresh, safe, and natural food to the customers.